Exactly 10 years ago I had just graduated from the Houston Opera Studio but still had no artistic management - having been politely but soundly rejected by 7 of NY's bigwigs, I had jobs lined up for the following season in Kentucky, Oklahoma and Arizona, I had badly misjudged short hair, and was busy living a life according to how I thought other people expected me to live. * A lot of charity - mostly Children's charities. Children and music - yes, a lot of that! *Take a safari every year. * Swearing. Often quite loudly. Often in multiple languages. Permanent residences: Prairie Village, KS, Wichita, KS, Philadelphia, PA, Houston, TX and Kansas City, MO. Temporary residences: the rest of the world. It's probably more information than you ever wanted to know! And for more pressing business, one more rehearsal left - which is really, essentially a performance since the theater will be packed with donors and friends of the opera, and other lucky folks who scored tickets. We're all very excited about the show - everyone sounds wonderful, the chorus is on top form, lights still need to be tweeked, and we need this last run to be 100% ready for the opening, but this mezzo can hardly wait - it's such an honor to sing this role. I still have to figure out how to make it through the last scene without crying. Time to run - that pasta is calling my name! 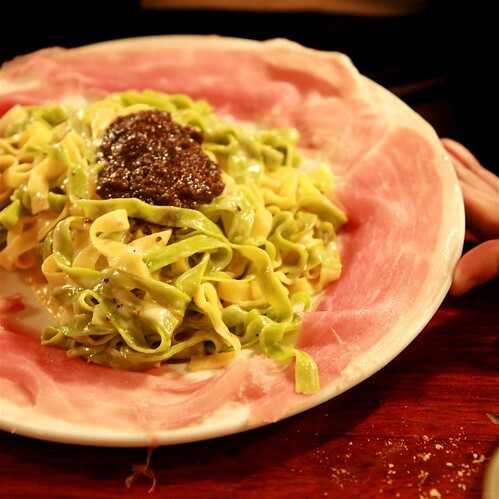 Paglia e Fieno: Fettucine giallo & verde con Prosciutto Crudo di San Daniele con crema di TARTUFO!! Yea!!! So, so excited for you and I wish I was there! Best wishes will have to do! You're almost there... Go for it...! I can't wait to read about your opening night as Romeo! And that pasta...Oh my. I'm drooling... seriously. When were you in Arizona? What did you sing here? Toi toi toi this weekend! Suzanne - I was there in the 98-99 season singing 2nd cast Rosina w/ Daniel Belcher! Time flies!!! Joyce, I have a question for you. Recently I've been thinking about what you wrote saying "Exactly 10 years ago I had just graduated from the Houston Opera Studio ... and was busy living a life according to how I thought other people expected me to live." I was wondering if you could point me towards or write a post expanding on this, what you learned from this. As a young singer who admires your attitude and your singing, it is hard to navigate who I am vs what I have to do to make it, or how everyone wants me to dress and have my hair cut. I know who I am, but I don't want that to get in the way of having a career, nor do I want to prance around feeling totally fake and covered in an opera femininity that just does not fit me. Do you know what I mean? If the answer to this is obvious, I apologize. If you need me to be more specific, I would be glad to. If there's anything you can do for me, I would really appreciate it. Hi, Scazza - I completely and totally empathize with your comment/question. And no, I'm not so sure it's completely obvious, although as with most things, once you "find" the answer, you hit your head on a wall and say, "of COURSE, it was so OBVIOUS! ", but it's not always clear GETTING there. I have an ambition to write a few posts on things like this in the coming months, as time permits, but please know you're facing a question probably every artist has faced at different times - how to stay true to your self, your art, and still function "in the game", so to speak. For the time being, I can only encourage you to completely listen to your gut instinct - if you can do that honestly, and directly (filtering out ego, insecurity, etc, which can be a big battle on its own! ), if you can do that, you'll be ahead of the game. The killer of this business is that there are NO guarantees - and we take risks all the time, hoping it brings us closer to our goals, and I suppose ultimately all we can do is "go for it", willing to fail along the way. I know it sounds like a bad inspirational poster, but it is pretty much my philosophy. I will try to get some posts written on this during the next season as I can!